Ia Adlercreutz has held top management positions in companies such as Kekkilä, Hasselfors Garden, and Fiskars. She now runs her own company Co-founders. 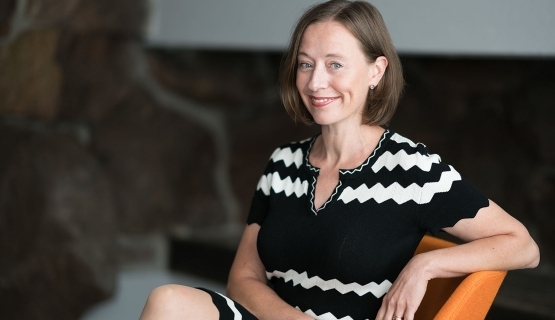 "The program has helped synthesize my own thoughts, which has strengthened the thinking and framework behind my own business”, says entrepreneur and CEO Ia Adlercreutz. “I’ve had a lengthy career in business development and brand management. The decision to take part in the EMBA program came naturally, as I’ve always studied in one way or another. I want to constantly develop myself. I have an unconventional background when it comes to business life: a university degree in communications and cultural history, and a degree from the University of Arts and Design in fine art. I see my diverse educational background as an advantage. I began my career as an entrepreneur, continuing at Kekkilä and Fiskars. In fall 2016, I decided to make my dream come true and return to having my own business again. Co-founders specializes in strategic brand management and in the development of company culture. I’m also a board member in several B2B and B2C companies. The program has proved extremely interesting at this stage of my career when I’m building a business." When I started my own company, I realized that I should complete an EMBA now if ever. The program has proved extremely interesting at this stage of my career when I’m building a business. Testing my thoughts and the idea behind my company with people who represent my customers is fulfilling. Personal thought processes benefit from the feedback and expertise of the 60 brilliant thinkers taking part in the program. During my studies, I’ve gotten my business up and running and worked – combining the two goes perfectly well. After a long career, the program seems to bring everything together. I’ve been taken aback by how well the teaching resonates with my philosophy in life. I have a strong focus on contextual management in my company. I believe that valuing in-depth knowledge will be on the rise, and wisdom and a deep understanding will be increasingly significant alongside know-how. It’s a result of artificial intelligence and automation, and will shift the focus point in leadership. I believe that the moral judgement of leaders will be more and more important. The Aalto EMBA program is a good platform for reflection, and offers a chance to discuss the value basis and significance of organizational culture in leadership. You have to read through twenty or so books with depth and reflection. Everyone is interested in what you think, and you have time to be interested in the thoughts of others – it not only develops personal thinking, but also the ability to pause and listen. It has helped me synthesize my own thoughts, which in turn has strengthened the thinking and framework behind my own area of business in a concrete way. The EMBA has an all-round educational quality, and the participants have already advanced on their career paths. The ability to process knowledge is already at another level than back in university. My group has a wonderful atmosphere of trust. With such tough competition in the business world, the incredible, genuine team spirit on the course came as something of a surprise.